When it comes to the imminence of change, there are a number of signs – some subtle, others blatant – that let you know it’s time to take that next step. But there are also many instances wherein we remain stuck in a job, relationship or similar situation when we’re unable to look past the tunnel vision we’ve unknowingly created. Whole Person Coaching tempers the continuous reasoning of the rational mind (“I can’t afford to do that,” “I’ll be letting people down,” “I won’t be able to match up to someone in terms of achievement or wealth”) and leverages the heart and gut to provide radical clarity on an individual’s true desires. The dynamics of Whole Person Coaching – and in particular its Courageous Space component – work to enable the client to build a new view of themselves, other people, and their life as a whole. From this perspective, the process of discovering next steps is simply a matter of becoming attuned to what they really want. More specifically, it enables an individual to filter out false messages and champions them toward following through on their goals. With that in mind, I’d like to introduce you to Jerry. He’s had one of the most diverse career paths of anyone I’ve ever met. He possesses a resume and range of experience that make him a fascinating storyteller and an individual who is able to competently advise people on everything from farming techniques and wilderness maintenance to high-end remodel construction, home inspections, and even matters of spirituality. Yet despite this nearly bottomless well of expertise, he has suffered throughout his life with issues of self-doubt and other personal insecurities. When he originally came to us, his outer goal was to build the value of his business. But it quickly became clear that it was time for something completely different. Here’s what he learned, and the conversations that got him there. The white noise of life can make decisions difficult, even impossible. But Whole Person Coaching cuts through it, quickly and permanently. The old adage ‘the forest through the trees’ is a very real struggle for many of us. Mired in our own rational modes of thinking, we fall victim to the common sense reasoning of our own minds, not to mention the expectations of others. These stumbling blocks throw the door wide open for doubt to infiltrate our confidence. And once it takes hold, it can often keep us stuck and struggling for years. Meet Jerry. With his life experience, I can honestly say he’s one of the most interesting people I’ve met. To give you a quick snapshot of his life: he grew up on a farm, went to college, got a degree in soils, and worked for a couple years on an irrigation project (which didn’t go anywhere). When he got fed up with that job, he considered the priesthood, applied, and was accepted at a seminary. It’s worth mentioning that if he hadn’t been accepted at the seminary, he was headed to a ski resort in South Dakota where he planned to get a job by leveraging his skiing and outdoor expertise – all while spending the winter skiing. But the seminary came through and he went, spending four and half years studying to be a catholic priest. During that time, he traveled all over the United States in a variety of spiritually-centered, service-based roles. But in the end, he stopped short of becoming ordained and was literally adrift, unsure of what his next step was. Moving to Portland, Ore., he met a friend who owned rental properties and landed a job as his handyman, fixing houses. From there, he branched out on remodeling jobs of his own, got licensed and did remodeling for the next 20 years. He then formed his own remodeling company, co-owned with another individual, and did high-end upgrades to a number of local homes and businesses. But again, he got burned out. So he sold his half of the business and took two years off, during which he put nearly 5,000 miles on his mountain bike. Never still for long, he built upon his construction experience and studied to be a home inspector, ending up the sole proprietor of a successful inspection business for the next 14 years. And that brings him to us – in a lifelong state of “in-process” – where he’s now facing the next change: retirement. 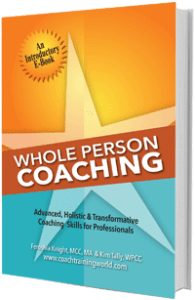 What is the true effectiveness of Whole Person Coaching? It acts like an idealized mirror, providing a third-party, non-biased reflection of support and encouragement to move an individual beyond the chatter of the mind. When he arrives on our doorstep, Jerry is lost in ‘not knowing’ – a state he describes as living at “the bottom of the canyon.” His predicament is compounded by a predisposition toward insecurity and doubt, both of which have infiltrated his confidence. Now in his mid-60s, he has a lot riding on the comfort and financial security of his future. At the same time, he’s extremely self-aware, and a devoted lifelong learner. He recognizes that, even though he has a tremendous amount of knowledge and skills, he’s stuck. A successful home inspector, he was hit hard during the economic fall. So Jerry’s stated goal is to accelerate the building of his business – a development that, from his narrowly-focused point-of-view, will enable him to either love the business more or increase its value for sale. But here’s where things take a detour. I hear a disparity between his outer goal and his inner goal. In particular, it becomes clear that his underlying wish is to discover that “next” thing. So in the sessions that follow, it becomes a dance between where to focus his attention: building a business that he doesn’t really love, or trying to discover what will really be most fulfilling to him in the long-run. One week he focuses on the business, the marketing and sales tactics, the grind. The next week, he gives himself permission to focus on exploring the unknown territories of his future – that next invention of who he is. “It’s the dance between the heart and the mind,” I reply. Can someone overcome doubt and find their way forward, overcoming a lifetime of built-up preconceptions, simply by tuning in to the wisdom of their whole self? Yes, they can! Whole Person Coaching integrates the discipline of neuroscience and, in particular, its central focus on connecting to an individual’s three brains. In short, we’ve found an unparalleled level of human development and personal success through a reliance on the unified perspectives and wisdom of head-based intellect, heart-based values and gut-based instincts. It’s a process that is usually accomplished by tapping into the wisdom of these parts through powerful questions. When we are out of alignment, we only listen to select parts of ourselves. And like one piece of a larger puzzle, it doesn’t give us the whole picture. In Jerry’s case, his head was shouldering all the weight, trapping him in the forbidding restraints of his rational mind. Part of my process was holding a space so he could feel safe, exploring what mattered most. He was very critical of himself. Yet every once in a while he’d let out that creative spirit and recognize he wasn’t inside his passions. Can Whole Person Coaching inform an individual’s personal life? Yes, by exploring and prioritizing interpersonal relationships based on the intuition of their mind, heart and gut. Whether he realized it initially or not, Jerry’s bigger, more meaningful goal was to conquer the doubt that had infiltrated his self-confidence. A lot of that is derived from our relationships with others, how we interact with them, and the amount and sense of fulfillment we receive through these interactions. Within our sessions, Jerry explored interpersonal relationships. He got clear on what he wanted and learned to say no sooner, before attachments where made. He also explored being more effective in his own communication style and, as a result, found that others started relying on him more, drawn to him on both professional and personal levels. The power of Whole Person Coaching is its ability to cultivate radical clarity in every aspect of an individual’s life. Whole Person Coaching nurtures clarity and self-trust in the individual. This trust is essential for successfully moving forward into unknown situations or risky endeavors. And it’s the holistic knowing – mind, heart and gut – that moves us beyond the shadows of our doubts to pursue what really matters in our lives. Put simply, coaching offers a state of clear direction, feeling comfortable with your decisions, safe, courageous and intently focused on next steps. As we say goodbye to Jerry, he has recently been informed by his CPA that he’s got the green light to retire. As an analytical person, he still ponders and thinks things through. But he now benefits from the complete wisdom of his whole self, connecting his head, heart and gut to make the best decisions ever!